If you're struggling with team dysfunction, underperforming employees and those who don't play nice at work, Tammy J. Bond has the transformation tools and fresh perspective you've been waiting for." -Daniel H. Pink, New York Times bestselling author Do You Play Well With Others…At Work? 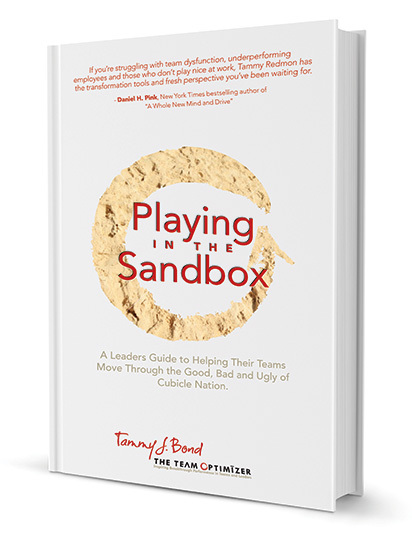 Playing in the Sandbox, by certified executive team coach, Tammy J. Bond, is a powerful, team management tool to combat: Underperformance Low Morale Leadership Breakdown Bond brings a bold, new perspective to a challenge millions face every day: team effectiveness and job satisfaction in cubicle nation. 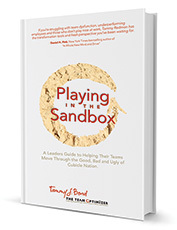 Her personal wit and direct style is refreshing, and combined with a ‘sandbox’ full of practical tools for increasing team performance, this book is a valuable resource to leaders and team members at all levels. “Though I amassed more degrees and certifications, they all sat quietly in boxes…the best education came from refusing to stay stuck by a demoralized work environment. I decided to pack up my successes and leave a career that I was passionate about to create a new path; a path to help teams and leaders who feel held back, broken, busted and disgusted find joy in their work once again. Please enter your name and email address to download a complimentary first chapter of Tammy's Book. You will be added to our mailing list.